Although there have been a lot of parenting surprises over the years, one that I did not anticipate was the increasing difficulty that comes with buying gifts as my children have gotten older. Back when they were younger they seemed to have more focused interests, but these days? It's like pulling teeth to get them to name anything in particular or come up with something that actually elicits excitement. Therefore, after spending far too long looking at online suggestions (all of which I did not purchase) and aimlessly wandering the aisles in big box stores (which also left me empty-handed), I was thrilled to be introduced to an award-winning toy that I instantly knew would be a hit for both of my kids this holiday season. More unique than traditional cars and much more entertaining than other remote control toys that I've seen, I had no doubt that Max Traxxx Tracer Racers from Skullduggery would create a stir as soon as they were out of the box. In all honesty, I couldn't wait to dig into the Max Traxxx Tracer Racers Remote Control Infinity Loop Set myself! As a leading toy manufacturer for 30 years, Skullduggery's vast product lines appeal to toy-lovers of all ages throughout the world. But while their craft kits and fossil replicas do look interesting, the Max Traxxx Tracer Racer car line has had my attention from the beginning. 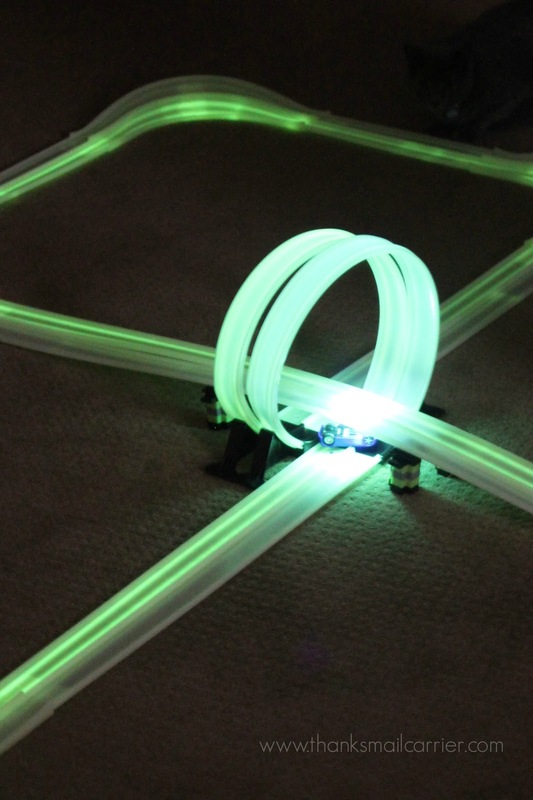 Who can resist an adjustable, customizable, glow-in-the-dark racing system? I couldn't wait to see these Tracer Racers and the Infinity Loop Track Set in person! 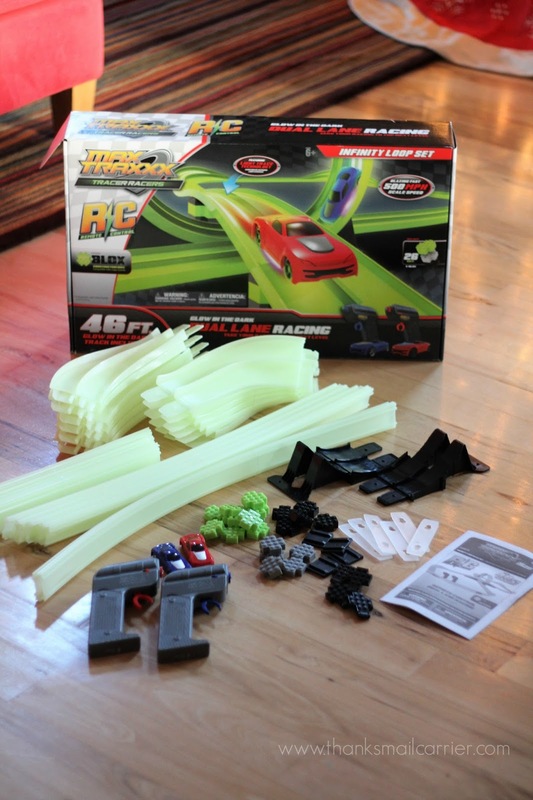 Right out of the box it was clear that Skullduggery had included just about everything needed in order for young (or, ahem, young-at-heart) racing enthusiasts to start putting together the endless racing circuit of their dreams. 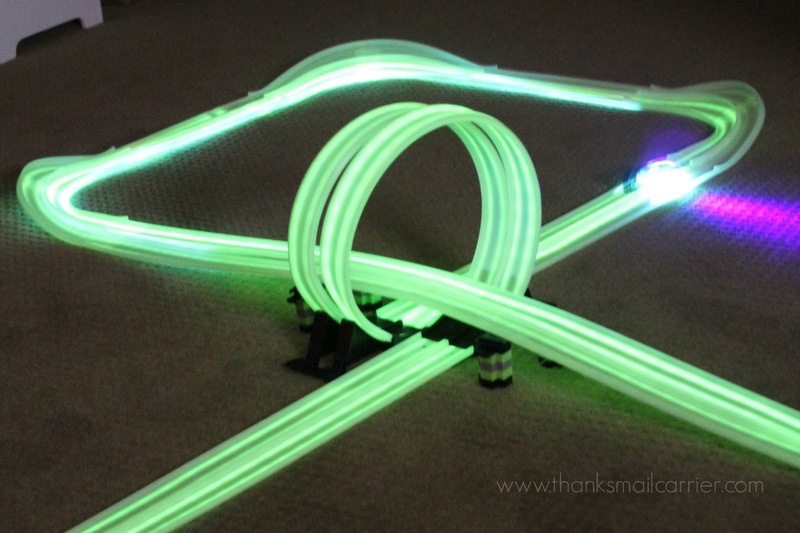 Including more than 46 feet of glow-in-the-dark track, two Tracer Racers and remote controls, 26 X-BLOX construction brix, and more, the only thing that this set needs to get started are the batteries. 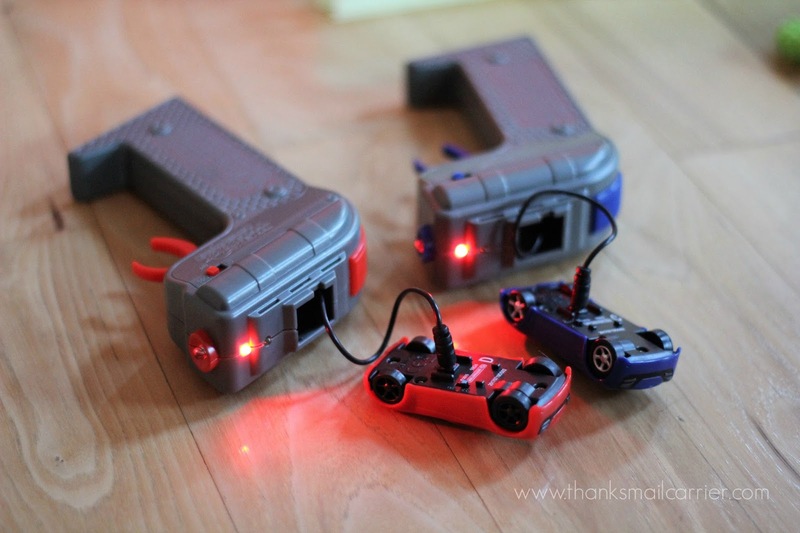 After opening up each of the remotes and setting the four AA's into place, I simply plugged the cars right into the cord on the top and flipped the switch to 'charge.' I love that the remote controls are the actual chargers instead of needing to keep track of a separate cable or plug (which would immediately get lost into the abyss of my house). 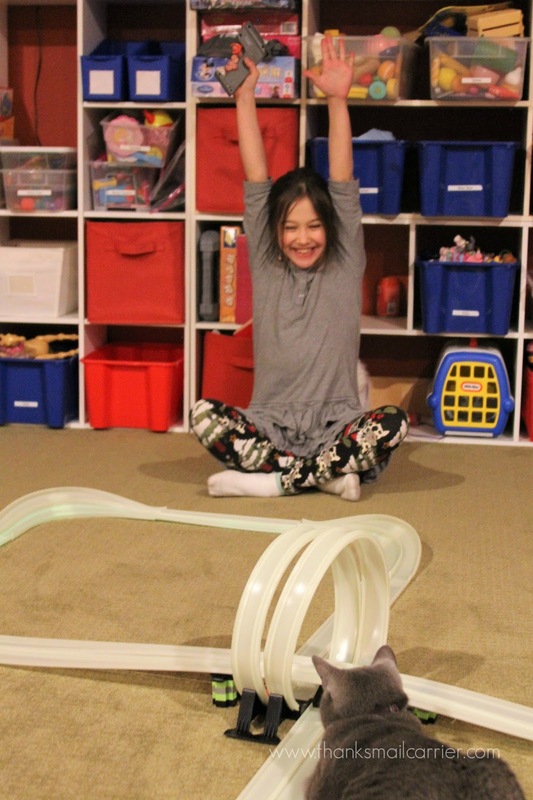 While the Tracer Racers charged up, it was time to construct the unique Infinity Loop Track Set. I adore that Max Traxxx parts are able to be mixed and matched and snapped together and constructed in just about an endless number of ways. Talk about a workout for the imagination! 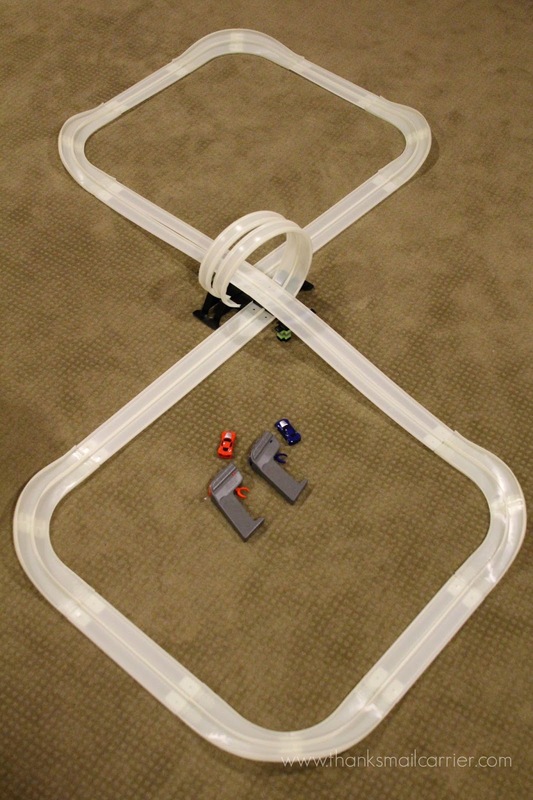 To begin, however, I opted to build the original figure eight shape to check out just why these loops, corners, and straightaways had won multiple awards. Could it really be all that cool? Don't let the angle of this photo fool you. This set is BIG! In a matter of minutes, the full track was together (each piece simply slides/snaps into the next) and it was time to rev up our engines. Hint: there is an on/off switch on the remote control AND on the bottom of the car itself. Make sure you have both turned to on for racing to begin! While Skullduggery had pointed out that the Tracer Racer Cars have a top to-scale speed of 500 miles per hour, I still wasn't prepared for how quickly they truly zip! Each little car can go forwards or backwards depending on the direction that users move the lever on the remote control and boy, oh boy, they can go fast! In fact, we found there to be a small learning curve when it comes to driving, as putting the pedal to the metal can lead to Tracer Racers flipping off the track as they come shooting around the corners. At the same time, driving too slow doesn't give enough speed to make it up and around the loop, so finding the sweet spot in the variable speed takes a little skill. But that sure didn't mean that Little Sister B was any less excited to race again and again and again and again! Although my young speedster was already having a blast simply zooming both Max Traxxx Tracer Racers around the track, as soon as I said, Now watch THIS and turned off the lights, her mind was officially blown. Even better, not only does the glow-in-the-dark track light up (which is cool), but the Tracer Racers themselves utilize Light Trail Technology and blaze streaks of light as they go (which is REALLY cool)! 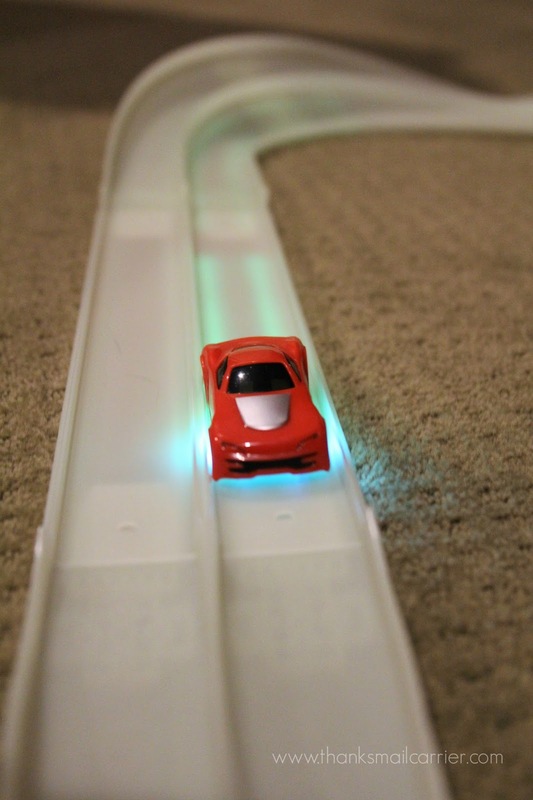 Each car has two small lights on the bottom that, when combined with the glowing track, leave a glowing path that slowly fades long after the Racer has passed. These really couldn't be much more amazing to see racing, twisting, and turning in a dimly lit room! Even a crash or wipe out looks incredible when all lit up in the dark! 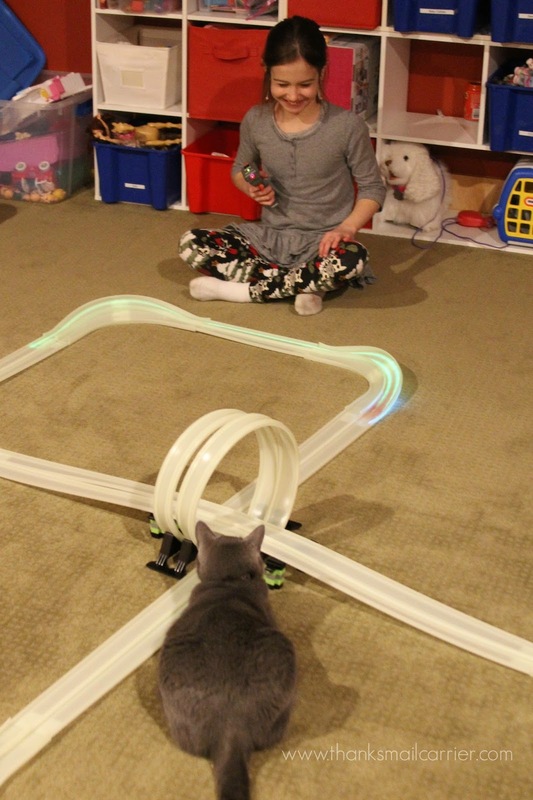 From the first day that we opened the Max Traxxx box, Little Sister B and I have spent endless afternoons cheering on our Tracer Racers as we send them flying around the track. There have been more times than one that we've only stopped playing because the cars begin to slow and the lights on the bottom don't shine, meaning it's time to let them stop and recharge. Fortunately, it's just so easy to plug them right into the remote controls and set them down until next time! Plus, while Little Sister B is happy to keep the Infinity Loop as is, but I have no doubt that in the future we will construct and reconstruct the various parts into our own creative layouts. By using the existing X-BLOX construction brix (and including our own compatible bricks of another brand), the sky is the limit on forming a track that goes up, down, and around in any number of ways! Whether you have a beginning or advanced race fan in your life, Max Traxxx Tracer Racers can provide hours of entertainment for all ages. This set is recommended for ages 6+ and I agree — it is easy enough to slide the pieces together and use the remote that younger children can do it on their own, yet the fantastic wow factor will keep older kids coming back for more. I dare you to spend less than a minute watching this video and not want to start playing with these yourself! 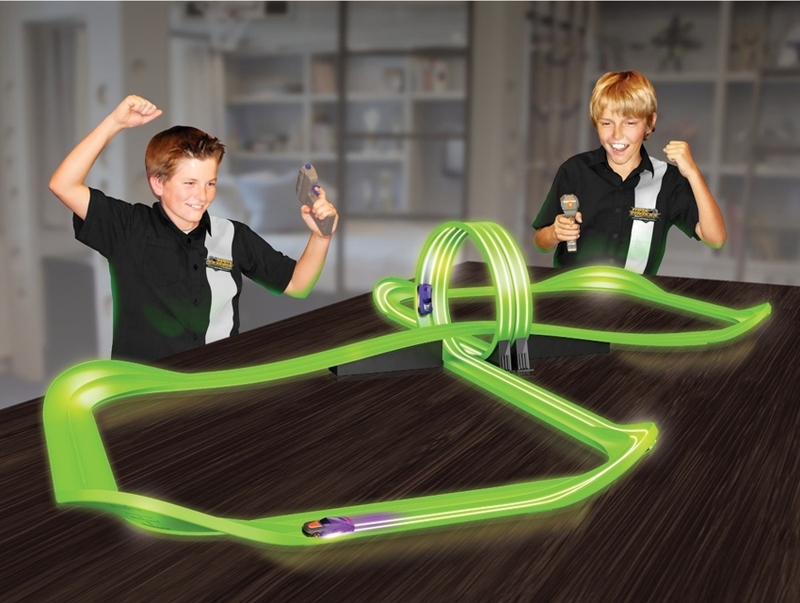 The complete Max Traxxx Tracer Racers Remote Control Infinity Loop Set retails for $119.97 and can be purchased directly from Skullduggery.com (with free shipping!) or on Amazon.com (where one of their sellers, 4% Change for Children, not only offers a $20 off coupon on certain days but also does amazing work donating to non-profit organizations that help children and families). There is still time to order this incredibly unique remote control track set in time for the holidays, so be sure to visit Skullduggery's website, Facebook, Twitter, Instagram, and Pinterest pages to find out more about this and all of their creative and fun products. 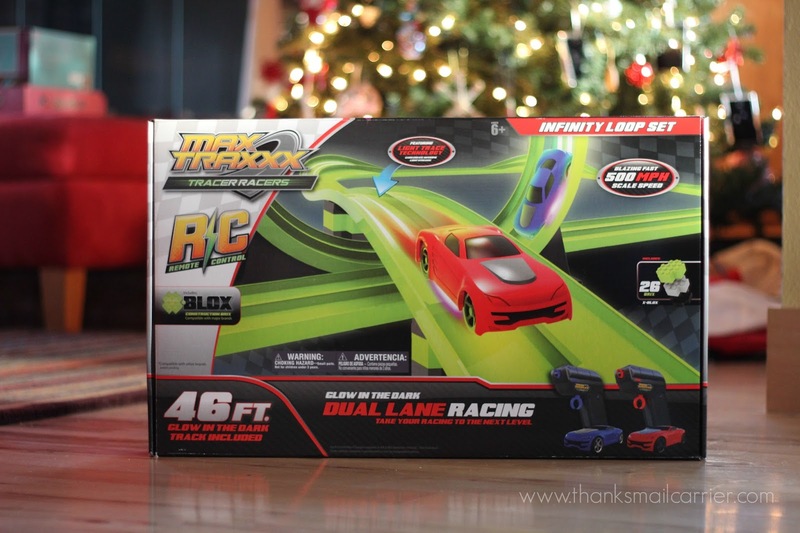 Other than the Max Traxxx Tracer Racers Remote Control Infinity Loop Set that I was provided by Skullduggery in order to facilitate my review, I was not compensated or enticed to do this post in any way. This post is solely my honest opinion about this product.